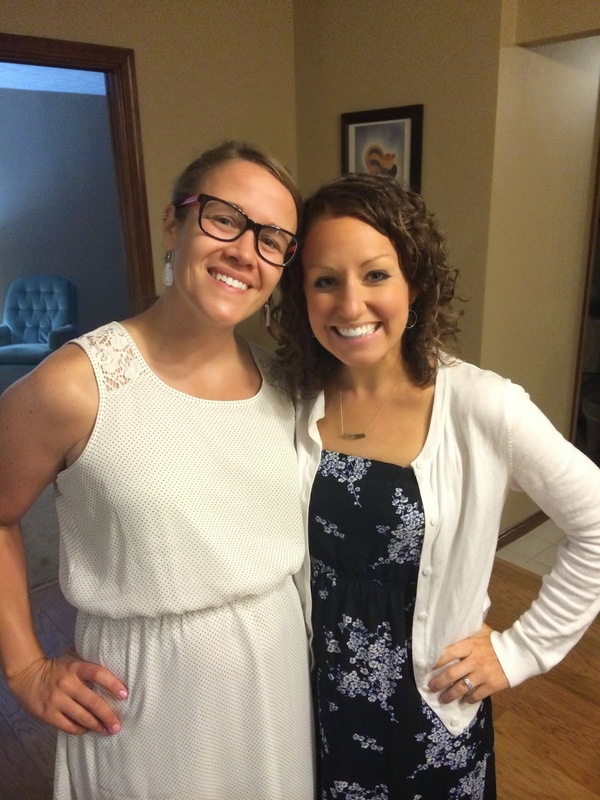 Two and a half weeks later, I'm finally writing about my best friend's wedding!! Natalie and Brian got married July 5th in Ohio, so the rehearsal was July 3. 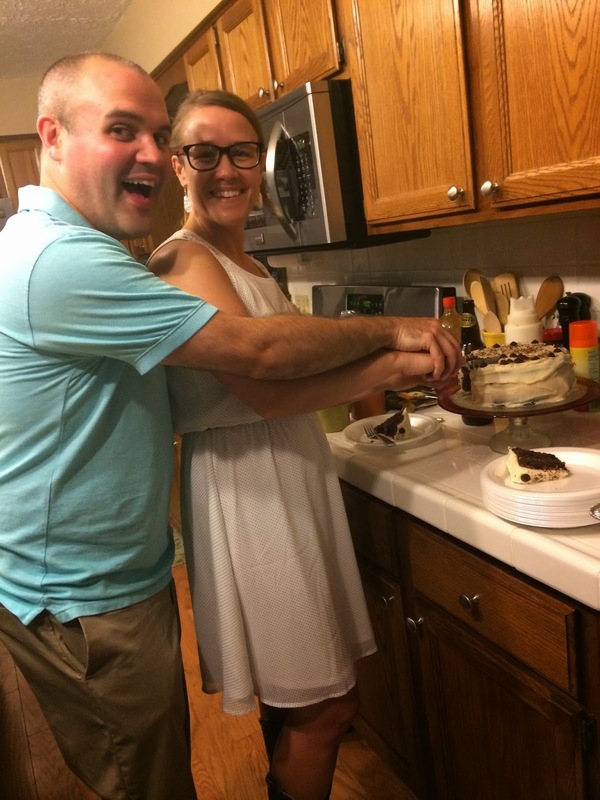 They were extra brave and had the rehearsal dinner at their house! Natalie's favorite taco truck actually catered the event, and filled up their entire island with food! It was all SOOOOOO amazingly delicious! 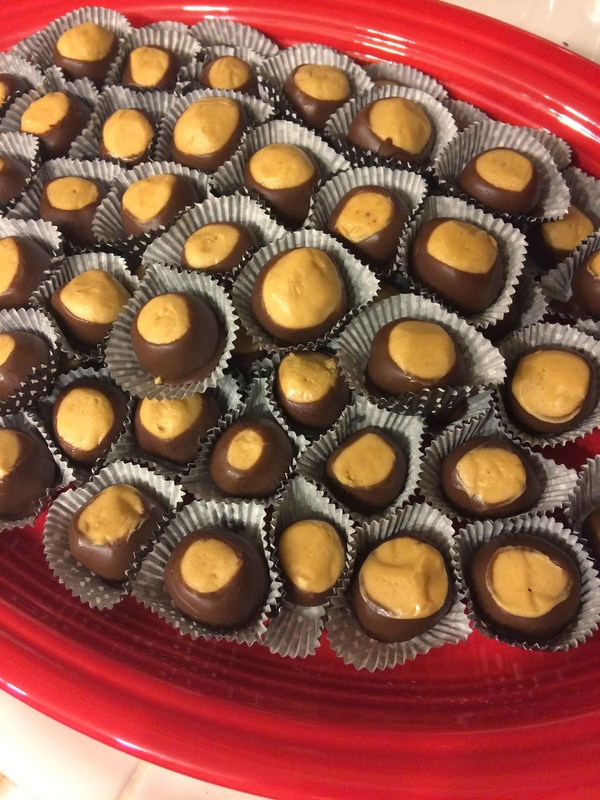 And if that wasn't enough food, Natalie also made buckeyes! My fav!!! And they had a groom's cake too! Natalie has about 295739 nieces, nephews and cousins, so they also had a piñata for the kids! How fun! Natalie also had a get-together at her house the next day for the 4th of July (I posted about it here). Tara (the other maid of honor) and I spent the night at Natalie's on July 4th so we could all get ready together on her wedding day! If you know Natalie, you know that she does not wear makeup, so this was a big deal that I had to get a picture of! Natalie's cousin is a wedding dress designer! So she made Natalie a custom made dress...short, because Natalie had always wanted a short dress, and with lace from her mom's wedding dress! 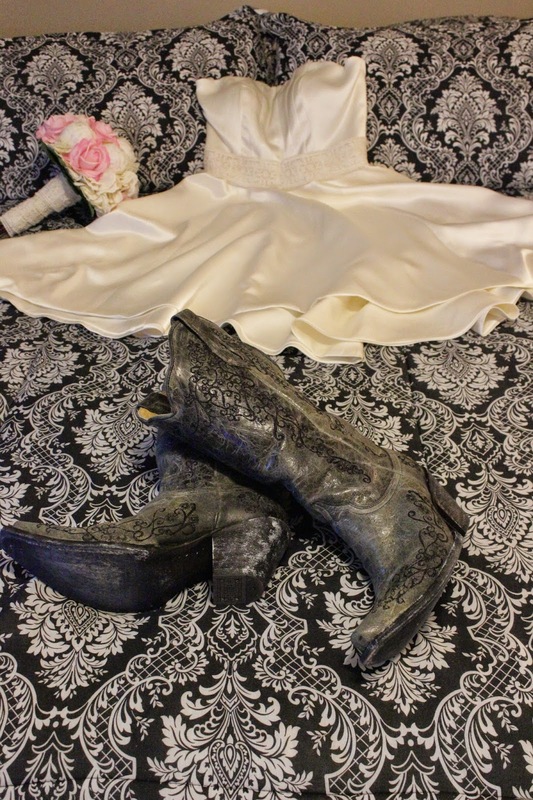 Natalie always said she would wear cowboy boots with her wedding dress...so cowboy boots it was! ...and had some Jimmy John's! 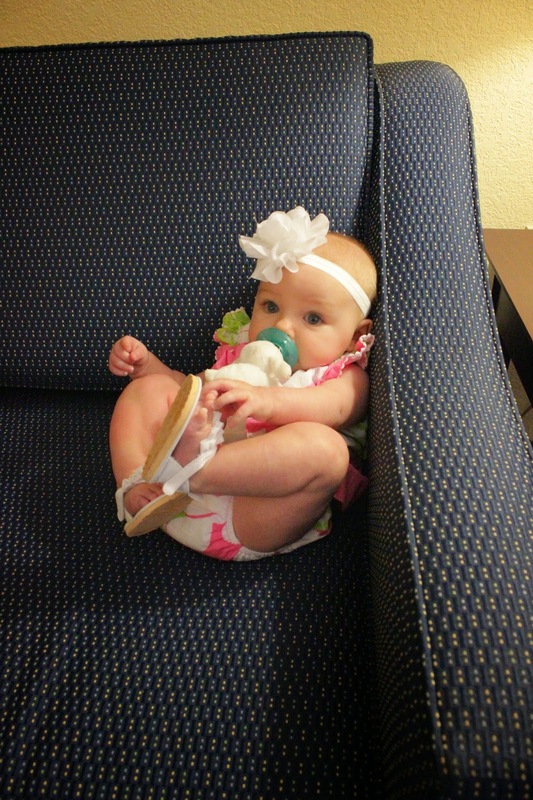 Ella also hung out with us while Trav went for a quick run...she was ready to party! The wedding was at a Catholic church in Akron. They had a full mass, which was kind of long, but I am glad we didn't have to stand the whole time!! It was a beautiful ceremony! ....and then we all met back at the hotel from a few drinks before heading to the reception! I didn't take very many pictures at the reception, probably because I was busy giving a speech in front of 225 people (nerve-wracking!!! ), and having lots of fun afterwards! 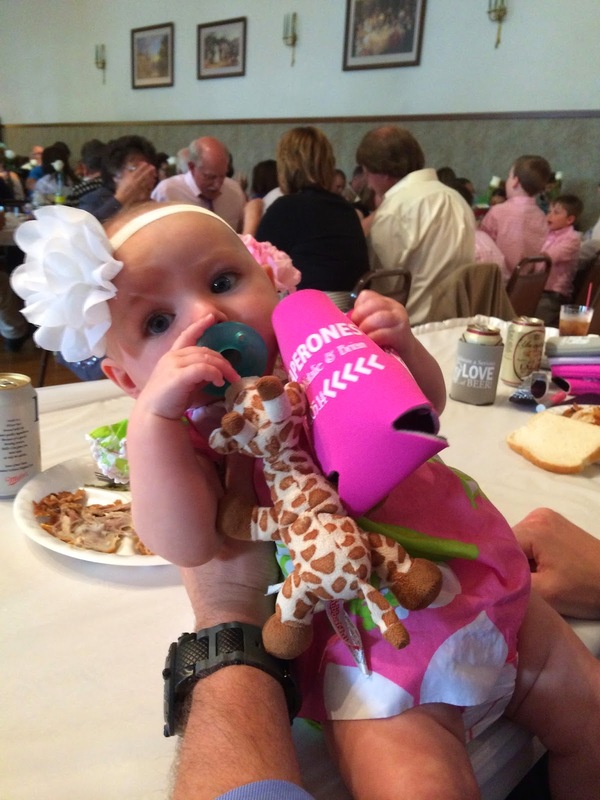 my child enjoying the koozie favors! Here are a few from Natalie's photographer, Chris Bues...he was awesome! Congrats Natalie and Brian!!!! I'm so happy for you both and I am glad I could be part of your special day!!! What a fun looking wedding!!!!!!! This wedding weekend looks like SO much fun! And you look gorgeous! !